How to Make Subwoofers Louder? Are you tired of listening less sound from the subwoofer? Or isn’t your amplifier powerful enough to produce enough sound for entertainment? Loud sound doesn’t always require expensive materials. As watts, as well as ohms, measures power and resistance respectively, the proper use of these duos can enhance the loudness. Also, amplifiers are expensive, and it requires a considerable amount of your bucks. On the contrary, learning on how the subwoofer works can save your bucks from buying additional sound materials. 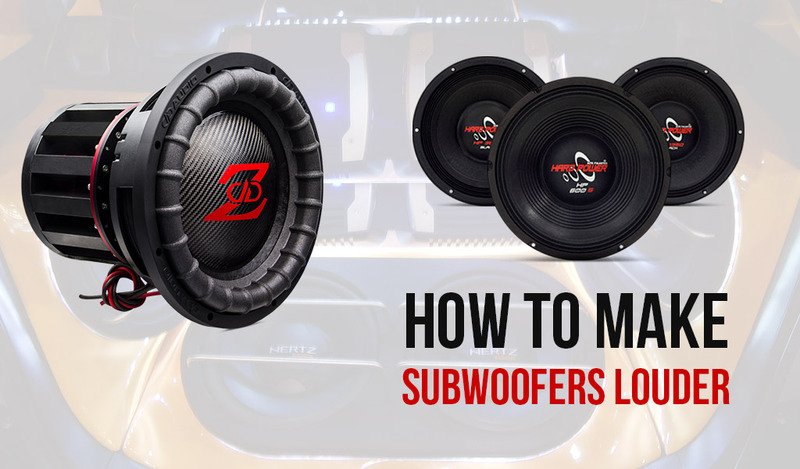 These simple adjustments will help you get wider sound and better bass from the subwoofer. 6 dB bass is enough to boost the sound without adding any materials or amplifiers. So, place the subwoofer in the corner of the room. Placing the subwoofer in the corner provides 6 decibels more bass than placing in the middle or near any furniture. Also, keep it free from attaching with the other tools. After placing the subwoofer at the right place, now make the phase of the subwoofer with the rest of the system. However, most of the subwoofers come with a variable of phase for 0 to 180 degrees position. So, join the subwoofer with the system and play heavy bass music. Now, adjust the bass until it sounds the loudest. When an adjustment is completed, you can now change the place of the subwoofer in any corner of the room. However, always try to avoid placing the subwoofer at the middle or the place of same distance from the walls. It’ll create distortion which isn’t a technical problem. So, it’s the best way to place in an asymmetrical position for the loudest sound with the deepest bass. Now it’s time to fine-tune the crossover controls of the subwoofer. You may adjust it earlier, but that may not match to the main speakers. So, the bass frequencies of the main speakers and the subwoofer can compete with each other and can cancel to provide it out. So, adjust the settings of the crossover to the primary system. It helps to provide the loudest sound with the deepest bass than the default factory settings or just randomly settings. It’s a common phenomenon that you’re in a dilemma of choosing between what you want and what you can afford. So, you have to try to build your car audio system on a budget. The car audio system includes some basic enclosures such as amp kit, amplifiers, and subwoofers. So, try to get the best possible entry level car audio system to optimize your system. Before finalizing your purchase, read the specifications of the audio equipment thoroughly. You’ll see how much resistance of ohm a voice coil requires to ensure maximum power to the amplifier. Also, the subwoofer needs the maximum power of watts from the amp. All these three equipment, i.e., the amplifier, the resistant and the subwoofer works simultaneously to produce the maximum sound. Any over power among them can ruin the entire system. So, never try to overpower your subs. A subwoofer has three types of boxes to get the sound which is responsible for producing the music from the loudest to the quietest. They are: Ported, sealed and bandpass. Now, think about the main factor of producing the loudest sound from the subwoofer as well as from the amplifier. It’s the only option to manipulate the sound if you find it. Fix it until you listen to your desired sound from the subwoofer. However, always try to put the jack in the right port. Otherwise, the entire sound system can be broken or be damaged. Never try to resort to stuffing the boxes or installing materials which lead to dampening the sound. Most of the subwoofer gets fine-tuned after changing the place. So, change the place at least 5 feet from the prior place and listen to the sound. If the place is the problem, it can help you a lot. Fix the new position for the subwoofer and play music. Now, examine your connectivity options of the subwoofer. Look into the interconnect cable to the input unit such as “Sub In,” “LFE,” “Direct” and “Bypass.” Now use a long interconnect cable for Sub/LFE RCA input to the receiver from the subwoofer. Here, run your receiver each time after change the previous position to test it runs well or not. After connecting the input cable to the receiver from the subwoofer, turn the control knob of the subwoofer to the maximum. Usually, the maximum denotes by the numerical settings. Control the volume to a fixed place from which sounds feels cozy. Also, never fix the control knob to the maximum. Because the highest isn’t always good as well as it can distort for low ampere. Almost all high-quality subwoofers can provide the highest quality sound and deep bass. But, everything lies in the best blend of the settings. So, always try to follow the user manual to get the best settings of the audio system. Otherwise, you can’t get the best value from your high-quality audio system. Even, you can avail your desired sound by knowing the settings well. So, follow the methods as mentioned earlier to get the compact settings and sound from the receiver, the subwoofer, and the amplifier. How to Stop Speakers From Buzzing? How to Install a Subwoofer to a Factory Stereo? How to Make a Subwoofer Box for Home? How to Connect Subwoofer to Receiver without Subwoofer Output? How to Wire Car Speakers to AMP Diagrams? MyAudioLabs.com is a participant in the Amazon Services LLC Associates Program, an affiliate advertising program designed to provide a means for sites to earn advertising fees by advertising and linking to Amazon.com. Amazon, the Amazon logo, AmazonSupply, and the AmazonSupply logo are trademarks of Amazon.com, Inc. or its affiliates.